Now advanced to a higher level of technology! Once your web design is finished you will need a web hosting account so everyone can see your new WebSite. We can help you set this up! We offer low density web hosting using the latest in Web server technology. 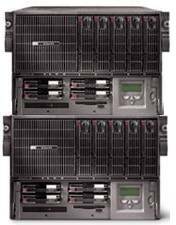 We feature HP ProLiant DL servers. Through its proven track record of industry-standard benchmark results, HP has consistently demostrated leadership in the performance and reliability of its servers. Using a state of the art Network Operations Center we can provide you the best reliability and speed at competitive prices while offering you small company service. Some ISP's will run as many as 200 accounts per server, many times on T-1 lines. We offer you a maximum of 60 to 70 active domains per server to ensure light server loads and fast response. Additionally, our commitment to no adult sites and no spamming make CyberCreekDesign a first choice for your business, church, family, or organization. If you need a domain name we can obtain it, register it, and park it until you are ready to put your web site online. Domain names have drastically dropped in price recently and we pass the savings on to you. Maintaining your website is a very important job. If running your business takes up all your free time, you should really consider turning this time consuming job over to professionals. CyberCreekDesign may be the answer.